As many bloggers (Marcus Nunes, David Beckworth, Scott Sumner, and Scott Sumner, among others) have pointed out, the Swiss National Bank, in pledging not to tolerate a Swiss franc-euro exchange rate below SF1.20, showed this week how much a central bank can accomplish in a very short time by acting decisively and with determination, qualities sadly lacking in the decision-making of the Federal Reserve Board, and, in particular the Federal Open Market Committee (FOMC). Even The Wall Street Journal (to the evident consternation of the lunatic mainstream of the commenters populating its website) applauded the move by the Swiss central bank. The Swiss National Bank’s announcement Tuesday that it would buy “unlimited quantities” of euros to keep the franc-euro exchange rate above 1.20 is a dramatic and helpful move amid the continuing euro crisis. But throwing a bone to exporters is not the most important reason for the central bank to intervene. Central banks are the monopoly suppliers of the commodity known as money. When a currency like the Swiss franc appreciates rapidly, the market is sending a signal that not enough francs are being printed to meet demand. In contrast to what central banks usually do when they conduct exchange-rate intervention, the Swiss central bank is saying that its monetary policy is subordinated to the peg. The quantity of francs issued by the central bank will be whatever amount the public wants to hold at the peg (the peg, in this case, being one-sided, the franc-euro exchange rate not permitted to fall felow SF1.20). Since the collapse of the Bretton Woods exchange-rate system in the 1970s, policy makers have grown fond of saying that markets should set exchange rates. But markets can’t set the value of a commodity whose sole supplier is the central bank, and this pseudo-laissez-faire is an abdication of central banks’ duty to control the supply of their currency, both internally and externally. Markets can’t set the value of a commodity whose sole supplier the central bank?! What does the Journal editorialist think happens every day in the foreign exchange markets? Who else but the market is setting the value of these monopolistically supplied commodities? Didn’t the Journal editorialist just observe “when a currency like the Swiss franc appreciates rapidly, the market is sending a signal that not enough francs are being printed to meet demand”? But while the Journal endorses the decision of the Swiss central bank to halt the demand-driven appreciation of the franc, the Journal has shown less concern over the past three years with appreciations of a similar magnitude in the dollar relative to the euro. 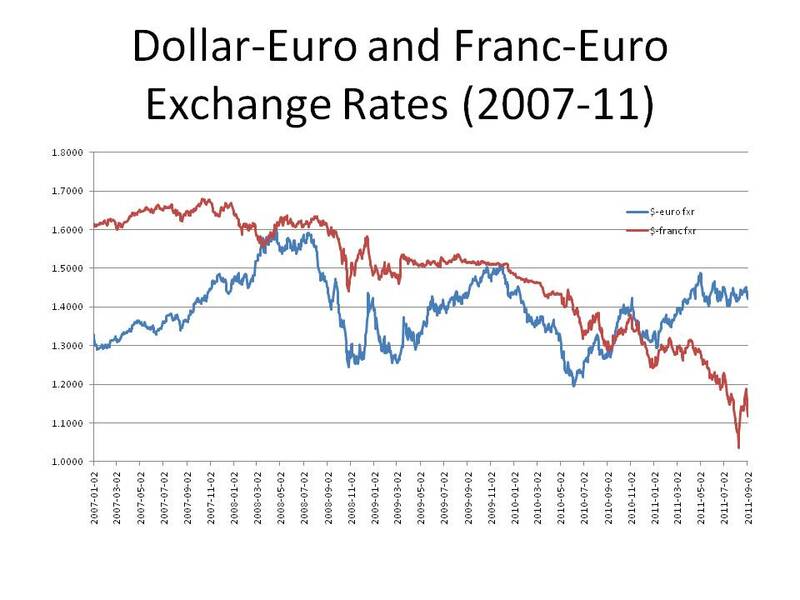 The nearby graph shows how both the dollar and the Swiss franc have fluctuated against the euro since January 2007. A recession beginning in December 2007, triggered by the bursting of the housing bubble, led to a gradual depreciation of the dollar relative to the euro from about $1.45 to just over $1.60 in April 2008, with the dollar fluctuating in a narrow range between $1.55 and $1.60 till the end of July. From August 1 to August 31, the dollar rose from $1.5567 to $1.4669 against the euro. On the Friday before Lehman collapsed (three years ago on September 5, 2008), the dollar stood at $1.4273, falling to $1.3939 on September 11, then falling to $1.4737 on September 23 and was still at $1.46 as late as Friday September 26. On Monday September 29, the dollar rose sharply to $1.4381 and by the end of October the dollar had risen to $1,26, nearly 30% higher than its value at the beginning of August. From November to March, the dollar remained in the $1.25 to $1.30 range against the euro, except for a blip from mid-December to mid-January when the dollar fell to about $1.40 before quickly recovering. Did the Journal ever once call for a reversal of this devastating appreciation of the dollar against the euro in the fall? From March through December 2009, during QE1, the dollar fell gradually from about $1.25 to about $1.50 as a recovery of sorts began, the economy growing 3.8% in the fourth quarter. The dollar then rose from $1.50 in early December to about $1.20 in June, remaining in the $1.20 to $1.30 range till the end of August, when, fearing the onset of deflation, Chairman Bernanke announced that QE2 would be tried. The dollar quickly fell from $1.27 at the end of August to $1.40 in November and, with only occasional movements outside the range, has remained between $1.40 and $1.48 against the euro throughout 2011. Yet the Journal and its regular columnists constantly complain about the dollar debasement caused by the Fed, even though dollar-euro exchange rate is roughly the same as it was in December 2007 when the downturn started. The Journal properly defends the decision of the Swiss central bank to reduce the value of the franc after having risen by about 20-25% against euro since April. Yet the Journal never misses an opportunity to castigate the Fed for reversing two episodes of dollar appreciation of at least as large as that of the franc against the euro, accusing the Fed of deliberate dollar debasement even though inflation over the last three years has been at the lowest level in half a century. Anyone care to guess why the Journal is more understanding of the Swiss central bank than it is of the US central bank? I suppose they would say that the CHF was clearly overvalued. However, the USD 2008 appreciation was only partially retracing the previous years depreciation. With the Fed having to introduce dollar swap lines with other central banks, there was clearly a shortage of dollars in the summer of 2008 and the USD appreciated accordingly. The 2008 USD appreciation actually started vis-a-vis the JPY and CHF in March 08, and spread to an appreciation against all currencies over the course of the summer. I think on your other occasions that there is a tendency to adopt a US-centric view when looking at the EUR/USD bilateral exchange rate. More likely considering the ongoing euro debt crisis that the causation was that the EUR was depreciating vis-a-vis the dollar. due to the Fed actions, whereas the Swiss Franc was overvalued relative to the USD by 50 %, or 25 % relative to the EUR. No industry survives so extreme misvaluations for long. A second point is, that all these CHF nominated mortgages and other credits in eastern europe would just drive the debtors into default, with these kinds of exchange rates. The Fed is enhancing mispricing against fair value, the Swiss are dampening extreme mispricing. Big difference. Excellent commentary. The WSJ has become unmoored, ranting against the Fed in the belief that the WSJ is thusly hewing to true conservative values. Forget what Milton Friedman told the Japanese. O am beginning to suspect the WSJ editorial page simply lacks the IQ anymore to discern true conservative commentary from partisan braying. Richard, I generally agree with you. I don’t say that the situations are entirely comparable, but the Journal is so emphatic in its condemnation of dollar depreciation (debasement) without any consideration of the factors that might be relevant in assessing them while in the case of Switzerland, the Journal is prepared to concede that there could be some reason to conclude that an appreciating currency is not always the single criterion on which to judge whether monetary policy is doing its job. About the source of the change in the $/euro exchange rate, I agree that recent depreciation has reflected a loss of confidence in the euro, but if people are shifting out of euros into dollars for that reason, it still can have deflationary implications for the US economy. genauer, I am not sure where your estimates of overvaluation and undervaluation come from and as I said to Richard I agree that the situations are not entirely alike. But the Journal takes a totally black and white view with respect to the dollar and a less absolutist position about the franc, and I am just noting the difference. Even if you are right, the Journal ought to be able to incorporate that reasoning into its editorials. Benjamin, Thanks. And also thanks for reviewing my book on Amazon. where do I have my data from ? Long term exchange rates and Goldman Sachs. I could do this a little more precise, by chaining each and every year with deflators and not just with the average of the inflation differentials. That may change the numbers by 1 – 2 %. The first page gives you an impression, on what time scale this is changing. To look at 2007 – 2011 is certainly not good enough to understand things. how that depended at that time on huge interest rate diffeentials, that the Ecu / EUR only exists since 1992 / 1998, depending on how you count, average and so on. The second page, you will most likely not really understand without a lot of explanations. It is just an illustration, that derived from currency valuations and the tax code, you can understand current account balances, quantitatively. For the Franken, various numbers of Bank Sarasin, FAZ.net and extending old numbers from Goldman do differ within 5 %. What you should understand, is that the exploding balance sheet of the Fed has little to do anymore with monetary policy as we knew it. And this creates a lot of problems somewhere else, like driving polish CHF mortgages into bankruptcy. Countries like Brazil have already started currency controls and more might follow. So, it is the FEd on the offense, and the Swiss defending against crazy misvaluation. I dont subscribe to the WSJ, so I only see the first 2 sentences of your reference, but I would expect that everybody investing globally should has some quantitative idea, where currencies “should be” a.k.a fair value, and this should not be far from my numbers. Very often, when I read e.g. blomberg article I kind of get fed up with lots of explanations of very simple things. Since the WSJ and FT targets a certain kind of people, they take more things as “generally known”. Try for example also ftalphaville. The reason I spend so much time on this is, that from my perspective it is a good example that you have to do economics with numbers and equations, look at data over many years, 20, 40, or more, and the “austrian school” is missing out on that completely. What the Fed and the SNB are doing, is the opposite in terms of international equilibrium and stability, and not the same. genauer, Sorry for not replying earlier, there was a lot going on and I am afraid that your comment got lost in the shuffle. I won’t argue with you about what the appropriate equilibrium dollar/euro exchange rate is or what the appropriate franc/euro exchange rate. The point that I was trying to make is that it is possible for a central bank to target an exchange rate as a method or achieving a price level target. In other words, if I am right that US needs to increase its price level by something like 10% ASAP, it can do so by forcing down the dollar exchange rate against other currencies. This is not exchange rate intervention it is a method of achieving a price level target. If the ECB doesn’t want to let the euro appreciate against the dollar they can prevent the euro from appreciating, but only by increasing their own rate of monetary expansion which would be exactly the right policy for Europe as well. So it would be a win/win situation.